Request is the most popular simplified HTTP request client for Node.js, and it was one of the first modules added to the npm registry. Designed to be the simplest way possible to make HTTP calls in Node.js, It has +14 million downloads per week. It supports HTTPS and follows redirects by default. On March 30th 2019, it was announced that request will go into maintenance mode and stop considering new features or major releases. So, if this library is so popular, why did the contributors decided to stop supporting it? What are the implications for the Node.js developer ecosystem? And most importantly, what are the best-supported alternatives out there? 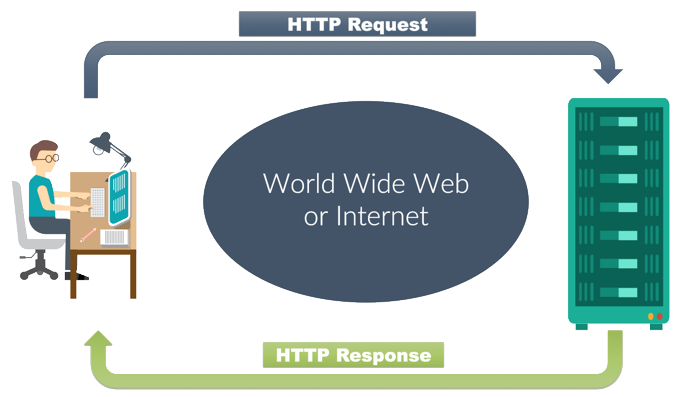 What Does Request Do (and, What is an HTTP Request)? HTTP stands for Hypertext Transfer Protocol, and the main purpose is to structure request (a user’s petition to a server) and responses (the data returning to the user) over the internet. HTTP requires data to be transferred from one point to another over the network. Request and other libraries were created to handle HTTP calls in a simple way, because even if the HTTP native module of Node.js can handle the HTTP calls, it is more difficult to configure and can introduce a lot of complexity to a project (simple things like configuring HTTP to connect to a proxy, or making a POST request, can get very complicated). For a popular module like request, maintenance mode means that the contributors will keep supporting the code, fixing minor bugs, refactoring, and making other minor changes, but they will not work extensively on creating new features, or major releases. In other words, the project will stop evolving. However, in this specific case the patterns at the core of request are out of date. For example, most people use async/await to work with promises. This pattern was first introduced to Node.js in version 8, but request doesn’t support it. And since request remains one of the most depended-on modules in the registry, creating a major change in the patterns would affect the more than 41,000 modules which depend on this module, as well as, thousands of blog posts and StackOverflow responses. As was pointed by Mikeal Rogers in this issue “The place request has in the Node.js ecosystem is no longer one of an innovator but of an incumbent. It’s much harder for new libraries accomplishing similar tasks to gain adoption because of the incumbent position request holds over the ecosystem. ...The best thing for these new modules is for request to slowly fade away, eventually becoming just another memory of that legacy stack. 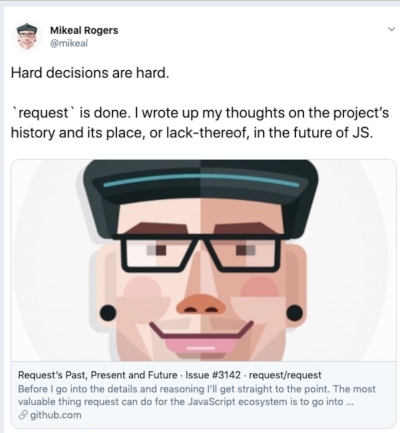 Taking the position request has now and leveraging it for a bigger share of the next generation of developers would be a disservice to those developers as it would drive them away from better modules that don’t have the burden of request’s history”. When a project such as request with +22,000 stars on GitHub, +280 contributors, and 144 releases, goes into maintenance mode, it usually means that the technology will become outdated soon, and people need to identify more current alternatives. Needle, Client Request, Bent, R2, Hyperquest and make-fetch-happen. 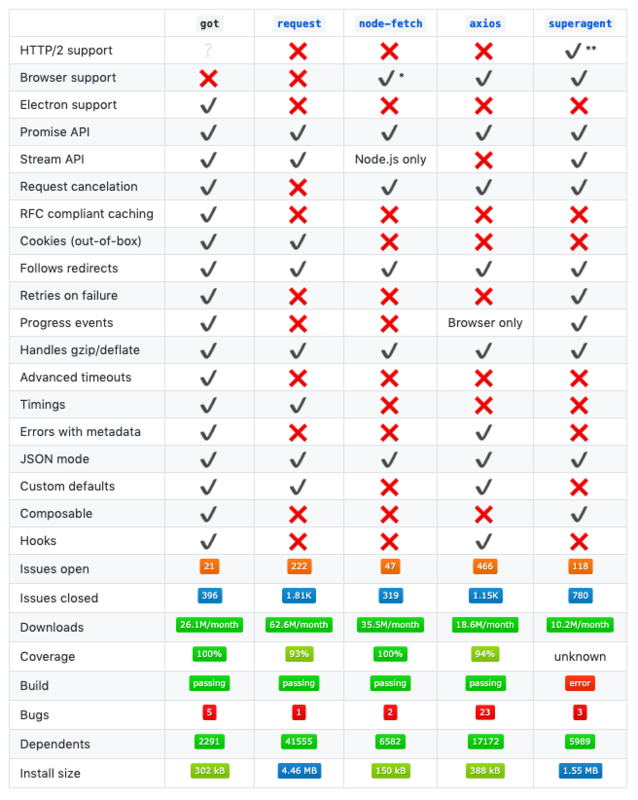 In the following table, we can visualize the comparison between the 5 modules and the most important features of each of them, such as size, HTTP/2 and browser support, promise and stream API, request cancellation, cookies, hooks, module dependencies, and issues. Got is a human-friendly and powerful HTTP request library. It supports redirects, promises, streams, retries, handling gzip/deflate, advanced timeouts and some convenience options. According to the documentation, Got was created because request is bloated (it has several megabytes! 4.46 MB compared to 302 KB of got). In this example we can see the usage of async/await and how it catches errors. Each error contains host, hostname, method, path, protocol, url and gotOptions properties to make debugging easier. In Promise mode, the response is attached to the error. It doesn’t have browser support. In the example above we can see a basic GET request, in a traditional way and using async/await. Axios lets you fully set up and configure your requests by simply passing a single configuration object to it. It performs automatic transformations of JSON data and has the ability to monitor POST request progress. Axios doesn’t support HTTP2, electron and Stream API. It also doesn’t retry on failures and works on Node.js with prebuilt promise support. Older version requires Bluebird or Q promise. It doesn’t have HTTP/2 and cookies support, RFC compliant caching and it doesn’t retry on failure. Also doesn’t support progress events, advanced timeouts, errors with metadata and hooks. Small progressive client-side HTTP request library, and Node.js module with the same API sporting many high-level HTTP client features. In the example above we can see how Superagent handles errors as well as promises with both callbacks and with async/await. Superagent is very well-known, it provides a fluent interface for making HTTP requests, a plugin architecture, and numerous plugins already available for many common features (for example, superagent prefix to add a prefix to all URLs). Superagent also has promise and stream API, request cancellation, it retries when there is a failure, it has progress events and handles gzip/deflate. The build of Superagent is currently failing. Also, it doesn’t support monitoring upload progress like XMLHttpRequest. It doesn’t support timings, errors with metadata, or hooks.